Buoyed by the emphatic 2-0 Test series victory over Australia a few days ago, hosts India take on England in the first of the seven cricket One-Day Internationals here tomorrow, hoping to continue their rich vein of form. Indian skipper Mahendra Singh Dhoni reckons switching from Test to one-day cricket mode in just three days’ time would be the major challenge when the hosts take on England in first of the seven ODIs here tomorrow. Pakistan’s chances of hosting the Champions Trophy next year would depend a lot on whether India tours the country early next year for a Test and ODI series, a top PCB official said today. Ryan Sidebottom’s absence notwithstanding, England captain Kevin Pietersen believes his bowling attack is capable of delivering the goods against the strong Indian batting line-up in the first of seven One-Day Internationals here tomorrow. “This is the most stable attack, since Steve Harmison and Andrew Flintoff have come back into the team. 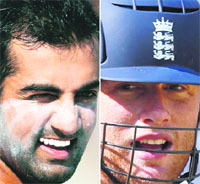 Then, we have (Stuart) Broad, (James) Anderson and Samit Patel who have been bowling brilliantly,” Pietersen said. The first of a best of three finals for the ICL 20s Indian Championship featured defending champions Hyderabad Heroes take on the mighty Lahore Badshahs in front of an 83,000 spectators’ packed Sardar Patel stadium in Ahmedabad. It was a high octane encounter that saw some intense cricket from both sides and ultimately saw the Lahore Badshahs draw first blood in the best of three finals by a margin of 4 wickets. Imran Farhat was declared man of the match for brilliant half century. Cricket Australia (CA) has suggested a more stringent system of punishment for slow over-rates and the authorities are likely to discuss the issue which might include penalties like docking of championship or rankings points. Haryan beat Jharkhand by an innings and 61 runs in their Ranji Trophy Elite Division match played at the Bansi Lal cricket stadium in Rohtak today. Haryana, who had scored a mammoth 500/9 declared in their first innings had dismissed the visitors for a platry 113 in the first innings forcing them to follow on. As many as 5,239 sportspersons from the state will participate in 30 sports events during the four-day 22nd Haryana Games, 2008, to be played at different sports stadiums, said the president of Haryana Olympic Association and additional director general of police, CID, Paramveer Rathi while talking to media persons here on Thursday evening. In the absence of World Champion Viswanathan Anand and Koneru Humpy, the Indian contingent will have to pull up their socks if they wish to make amends for last year’s disappointing performance at the Chess Olympiad that starts here. The euphoria over their triumph over the world champions is yet to die down, but Mahendra Singh Dhoni and his men - including those who were not part of the Test series - know that England provide a new challenge in the limited-over format of the game. Kevin Pietersen-led England had reached this country when the fourth and final Test in the Test series for the Border-Gavaskar Trophy was heading towards its climax and must be aware of the enormity of the task that awaits them at the Madhavrao Scindia Stadium here. Even in the absence of the Test stalwarts, including Sachin Tendulkar who has been rested for the first three games and injured, new pace sensation, Ishant Sharma the hosts carry too many potent arsenal for the liking of England. The home team will certainly miss Ishant, Man of the Series against Australia, who has been rested because of a slight ankle strain. But in the likes of Munaf Patel and R.P. Singh India have capable speedsters to deliver the goods in tandem with in-form spearhead Zaheer Khan. The return of Virender Sehwag, who missed the ODI series in Sri Lanka that India clinched in August, will see the swashbuckler open the innings with his Delhi team-mate Gautam Gambhir who was forced to miss out the Nagpur Test because of the one-match ban imposed on him by the ICC and is now available to play. With in-form Rohit Sharma and Suresh Raina bringing in the daring approach to batting, besides some fresh pair of legs on the field, a concern for the home team lies with Yuvraj Singh who creamed a century against Australia in the pre-Test series warm-up tie at Hyderabad before going off the boil. With the hard-hitting Yusuf Pathan available to liven up the slog-over hitting in the company of his captain Dhoni, the batting looks formidable while the spin attack also sports a strong look with the feisty Harbhajan Singh heading it. The visitors must have fancied their chances in India soon after winning 4-0 against a top outfit like South Africa a few months ago, but they now need to rediscover that sort of form quickly in alien conditions if they want to bring down the high-flying hosts. They have also come here after losing badly to Stanford Superstars in the one-off Twenty20 game played for millions of dollars in Antigua, West Indies, and promptly lost to a second string Mumbai XI in the second of two warm-up games two days ago. Pietersen has offered a brave face despite the humiliating loss in Mumbai. “I think the guys are all right, we just need to turn our heads on now and make sure we start on Friday,” he said after the shock reversal in a match in which they were bowled out for a meager total. Making it more difficult for the visitors is the non-availability of left-arm swing bowler Ryan Sidebottom who has not played a match since landing in this country because of a heel injury. But, much to their relief, young pacer Stuart Broad, the bowler creamed for six sixes in an over by Yuvraj in a Twenty20 World Cup tie in South Africa in 2007, has passed a fitness test and would be part of the playing XI tomorrow. Pietersen and talismanic all-rounder Andrew Flintoff need to be at their very best form in order to overturn the 1-5 thrashing they received in India in 2005-06. Flintoff, incidentally, is being given special attention by their batting coach Andy Flower, who was enormously successful for Zimbabwe in these conditions during his playing days, to counter India’s spin threat. Owais Shah is among the batsmen to play spin well but the onus will be on openers Ian Bell and Matt Prior to stave off the danger posed by Zaheer and whoever opens the Indian bowling with him to lay a strong platform for the visitors. It will also be the first time that the new Power Play rules for ODIs, introduced on October 1, will be used in Indian conditions and it would be vital to both the teams on how well they adapt and use them to their advantage. In a significant change, the batting side can choose the timing of either the second or third Power Plays, of five overs each, both chosen earlier by the fielding side. The Teams: India (From): Mahendra Singh Dhoni (capt. ), Virender Sehwag (vice-capt), Gautam Gambhir, Yuvraj Singh, Rohit Sharma, Suresh Raina, Yusuf Pathan, Harbhajan Singh, Zaheer Khan, Pragyan Ojha, R P Singh, Munaf Patel, Virat Kohli, Murali Vijay. England: Kevin Pietersen (capt. ), Ian Bell, Matt Prior, Owais Shah, Paul Collingwood, Ravi Bopara, Andrew Flintoff, Samit Patel, James Anderson, Stuart Broad, Steve Harmison. “It’s never easy when you play back-to-back international series. We had three days’ time to switch over from five-day to one-day series. It’s quite tough but then as an international cricketer you are supposed to play and adapt,” said the wicket keeper-batsman ahead of the first of seven ODIs here. Dhoni, however, expects a smooth transition because half of the players in the ODI squad did not play in the Border-Gavaskar Trophy Test series against Australia. “One of the good things is that half the side hasn’t played the Test series. It’s good right now. But I have played Test cricket as well as one-day series, it is quite difficult to switch over to one-day mode but as I said we are international cricketers. We are professionals,” he said. Looking ahead, Dhoni said even if India didn’t take an early lead in the series, the hosts should remain optimistic. “If we lose a few games, we shouldn’t feel low. We will win some and lose some but we will always have to be positive frame of mind,” he said. Saleem Altaf, the chief operating officer of the board, said the ICC would be closely monitoring the progress of the Indian team’s tour and implementation of the security plan during the tour before it meets to decide if the Champions Trophy should remain in Pakistan. “The ICC has kept the Indian tour to Pakistan as a benchmark for deciding on the relocation of the Champions Trophy because of the security situation in the country,” Altaf said. The ICC has already postponed the Champions Trophy this year because of security concerns by some teams about playing in Pakistan. Although the ICC has rescheduled the tournament to September and October in 2009 in Pakistan its executive board will take a final decision on the venue in March or June next year on the final venue. Altaf said for the time being, there appeared to be no threat to the Indian team’s scheduled Test tour to Pakistan but conceded it would only be final next month when the Indian government clears the tour. Some doubts have crept in over whether India would tour Pakistan next year following the last minute cancellation of the Indian junior hockey team's tour to Pakistan this week. “So far we are confident and our policy remains to first try to keep on convincing teams to play as scheduled in Pakistan which we will also ask the Indians to do and hope they will do so,” he said. But the PCB official said if for some reason the Indians didn’t get clearance to play in Pakistan, the PCB policy was to keep its other options open like playing at neutral venues. “We do not disregard the option of shifting the series to Abu Dhabi, Dubai and Sharjah or some other country. England is also willing to play hosts for the Test and one-dayers so we have options. The bottom line is that we need finances for the sport to survive and thrive in Pakistan and we can only earn money if we keep on playing international matches,” Altaf said. Meanwhile Rajeev Shukla, chairman of the finance committee of the BCCI told a Pakistani news channel that so far the Indian board was comfortable with the tour. “I think our bowling has been the best in the last month or so and if we can bat well, it will be a good match,” he said ahead of the first one-dayer at the Madhavrao Scindia ground here. He also justified the inclusion of Ravi Bopara in the playing XI ahead of Luke Wright. “It’s unfortunate for Luke because he’s done nothing wrong to be honest but Ravi Bopara is better on these wickets,” he said. The gangling batsman also hoped that the return of seniors like Flintoff and Harmison would lend the side the necessary experience in the upcoming battles. Earlier in the evening Inzamam Ul Haq won the toss & elected to field, taking the due factor into consideration and the fact that Lahore were playing with two front line spinners Saqlain & Arshad Khan. The Hyderabad openers Khaleel & Maher got off to a steady start taking the score to 25 for no loss at the end of the 3 rd over. Just when the Hyderabad openers were trying to take the initiative; Inzamam introduced his inform strike bowler Rana Naved in the 6th over, who trapped the talented Ibrahim Khaleel LBW for a well made 25 and in turn ending the 49 run partnership for the first wicket. In the end some brilliant bowling by Rana Naved in the death overs helped pull back the Hyderabad batting juggernaut at 170/5 in their allotted 20 overs. Fall of Wickets: 1-49, 2-138, 3-153, 4-155, 5-170. Bowling: Sami 4-0-27-0, A Mahmood 4-0-37-0, Naved 4-0-25-3, Arshad 4-0-43-0, Saqlain 4-0-31-1. Fall of Wickets: 1-28, 2-82, 3-127, 4-136, 5-137, 6-142. Bowling: A Razzaq 4-0-35-1, KS Sahabuddin 2-0-30-0, Reddy 4-0-28-1, Boje 4-0-20-1, Harris 3.1-0-25 1, Binny 1-0-10-0, Anirudh 1-0-15-1. CA chief executive James Sutherland said the game lacked the necessary sanctions to prevent teams falling behind in their allocated overs, like the scenario in Nagpur last week when Ricky Ponting's side blew a golden opportunity to save the series by bowling part-timers in order to make up a nine-over shortfall. ''Umpires certainly have that responsibility out on the ground, but they have a responsibility to communicate (about slow over rates). They don't necessarily have a remedy or a stick in their hand to deal with that,'' Sutherland was quoted as saying by The Age today. ''We've been very successful here in first-class cricket by introducing penalties that are aligned to points, so, all of a sudden, no one has trouble bowling 96 overs in a day in Sheffield Shield cricket because if they don't, it will impact on their points and it will mean there will be a greater likelihood they will miss out on the Sheffield Shield final. Haryan beat Jharkhand by an innings and 61 runs in their Ranji Trophy Elite Division match played at the Bansi Lal cricket stadium in Rohtak today. Haryana, who had scored a mammoth 500/9 declared in their first innings had dismissed the visitors for a platry 113 in the first innings forcing them to follow on. Although the Jharkhand side did put up an improved show in the second innings, it was not enough to overhaul the hosts' score. 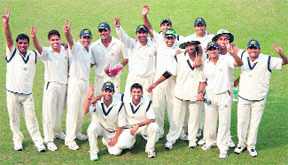 The Haryana bowling attack was spearheaded by Dhruv Singh who picked up five wickets to ensure a Jharkhand defeat. Tarsemlal picked up two wickets while Budhwar and Sachin Rana got one wicket each. For Jharkhand a fine batting performance and a century by Ishank Jaggi, who scored a valiant 101, and some support by Subroto Ghosh, who scored 89 and captain Manish Vardhan (44), were the only signs of a fight in the entire match. With this win Haryana picked up all six points. Second Innings: 326 (Ishank Jaggi 101). Haryana Chief Minister, Bhupinder Singh Hooda will inaugurate the games on Friday at the MNSS Rai and Haryana Governor, Dr A.R.Kidwai will give away prizes on November 17. 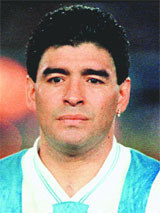 Just weeks after becoming Argentina’s coach, reports say Maradona may quit !